Kick your notes up a notch with this divine design! Set includes 12 folded 4 1/4" x 5 1/2" Note Cards and white envelopes. 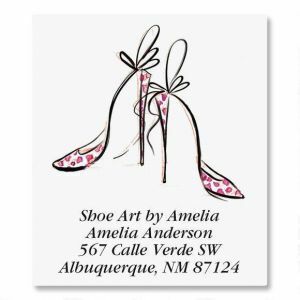 Ideal for thank you notes, invitations, everyday and formal correspondence, cards are personalized on front and blank inside for your personal message. Turned-around vertical business card design will turn heads with its kicky look. 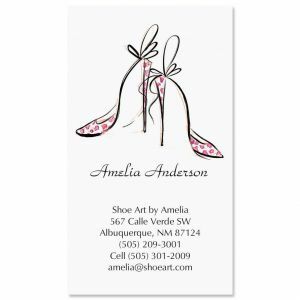 A card that won't get lost in the shuffle, set of 250 Personalized Business/Calling Cards measure 2" x 3 1/2" each. We'll print them with the name and address, message, or information you choose. Specify line 1, up to 18 characters and lines 2-7 up to 30 characters. SAVE $1.00 each when you purchase two or more business card sets!